Did you know it was Invisible Illness Awareness Week? Maybe not - 'cause it's invisible! Well.... you know. As invisible as it can be. There's lots of illnesses that are invisible. But I'm going to blogging about those that are nearest and dearest to my heart. No, I'm going to start with Celiac Disease. occur to the small bowel even when there are no symptoms present. rye, barley and triticale and MUST be eliminated. How's this for invisible?? SPELL CHECK didn't even recognize Celiac!! I had no idea about the complexities of this illness. I knew a little about it before D ... but I thought that it wasn't that big of a deal. Diet change. You could eat a little... just not a lot.... of gluten. Uh...no. That's like saying that Sweetpea can eat a LITTLE bit of carbs without insulin. Just doesn't work that way. Oh how clueless we are until it smacks us in the face! Have you ever paid attention to what foods contain gluten... wheat... Well, it's pretty much EVERYTHING!!! Sweetpea has been tested for celiac and was negative. But it's not uncommon for people with diabetes to also have celiac. So we'll keep testing... just to make sure. Check out Wendy at Candy Hearts. She has celiac and so does super sweet Sugar - her T1D kiddo. Check out Gluten Free Eating. This family also deals with Celiac and Type 1. Lots of great recipes! SO..... when Sweetpea visits the library, she often gets Berenstain Bear books. 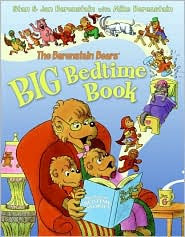 At a recent visit with Mimi and Gaga, Sweetpea picked up the book, The Berenstain Bears' Big Bedtime Book. This is a cute book filled with traditional stories and fairy tales.... but they all have a twist! My favorite was The Little Red Hen. In this story, the characters all HELPED make the bread. They all pitched in! And at the end, when the Little Red Hen asked who would help her eat the bread..... THAT was when they said, "Not, I." The reason? They are all allergic to wheat. So, I dedicate this story to all my dear friends fighting the invisible battle with gluten. Fight on, friends. Stay strong. I know life isn't easy. I know cooking might well be a nightmare. But at least the Berenstain Bears "get it"! Awwwww.....Thanks for this SUPER SWEET GLUTEN FREE post!!!!!!!!! I really appreciate the Gluten Free love from the DOC....YOU GUYS ROCK! By the way, it DRIVES ME CRAZY everytime I type the word Celiac and it comes up as a spelling error!!!! Nice job, Hallie! You even have a song to match the post! AWESOME and THOUGHTFUL post for our buddies dealing with Celiac Disease. I cannot even imagine having that in the mix with "d". Oh my goodness, I just feel like you are my new best friend! Brian Doss from the JDRF in Northwest Arkansas lead me to your blog and I just feel so...hmmm, what's the word...at home! First of all, I haven't found anyone whose child was diagnosed at 3 or earlier so that is a relief. Our son was diagnosed at 3, exactly one month ago today. Also, I think my daughter and your daughter could be twins (a year apart, but still)! Right down to the Gymboree Watermelon dress! I so wish that we could come to your JDRF walk. I can't tell you how many times we sing "A dream is a wish your heart makes..." We LOVE Cinderella! ;) Aiden, too. Ha! But I just know that I will learn so much from you. Thank you for sharing all of this on your blog. Ketone comes up in spell check too... what is that?? I could not imagine anything else on top of D either. Maybe I shouldn't write that just in case someone is wanting to prove me wrong?!?! I love the Berenstain Bears! That is awesome that you thought of Celiac's disease. Very nice post. Thanks for the Celiac shout out...it's the cherry on top of D I tell you! Sick of Carbs coming up in spell check too, but that is me being picky becuase it's just a nickname for Carbohydrates and all...but about your awesome post...I give props to the celiac peeps of our community. Another thing to think about, I think my brain would officially explode!